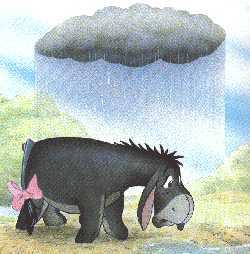 Eeyore quotes, songs, and stories! You think you can depend on tails. You don't expect tails to go wrong. The last time I looked it was right there. Now when I look there, it's gone. It was always just behind me, always tagging along. I thought it was there, and it's gone. That it actually hung true. I'd hoped it was stuck very firmly on. Maybe we needed some glue. It used to trail right behind me, always tailing along. I thought it was there...now it's gone.